The elegant Brooke over mirror bathroom wall light designed and manufactured in the USA. 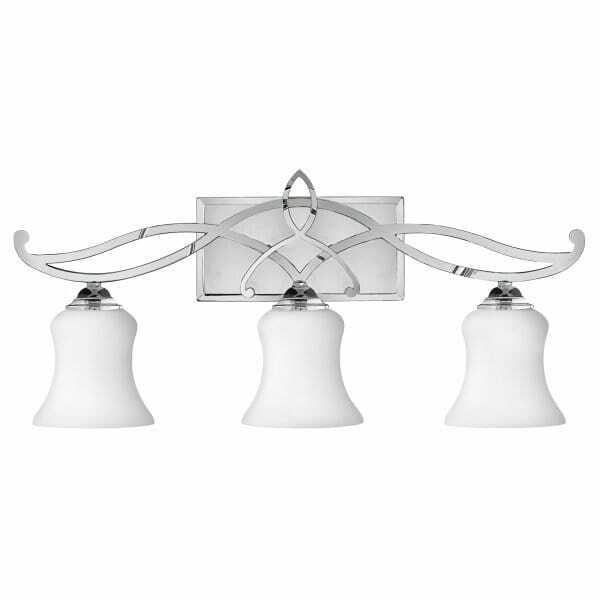 With its updated traditional look, forged scroll design metalwork in polished chrome and an etched opal glass shades this wall light will fit easily into both traditional and modern bathrooms. We love the detailed scroll work which gives a softer more luxurious look to a bathroom. Often these small decorative details are missed in bathrooms and maybe it's time to add a little grandeur to your bathrooms. This wall light can be fitted facing up or down and looks equally as good in either position. Having 3 light bulbs of course gives the added benefit of giving lots of light. Great if you have low ceilings in your bathroom as you can still have feature lights when you have the â??Brookeâ?? light. It has an IP44 rating making it suitable for using in both zones 1 and 2 of the bathroom.